Short Codes 4471, 4472, 4473, 4474, 9984, 9985, 9986 which are popular numbers for 2-way SMS Communication (but can handle incoming SMS only from Pakistan). SMS Long Codes like +92-312-4444033 are also available which can allow incoming SMS from any part of the world. 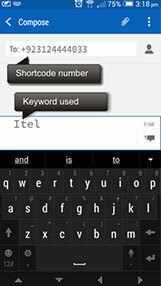 Shared Long Codes allow you to setup your chosen keywords on the ITel platform. Manage your own Text reply for your keywords. Can be used for Contests /Polls etc.